Are your kids getting bored? Do you want them to have a fun yet educational and eco-friendly summer? 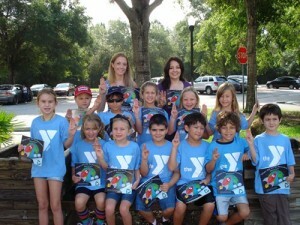 Check out the Bob Sierra Family YMCA in Tampa. As part of their summer camp program, they are offering G.I.V.E Camp. G.I.V.E. stands for Get Involved Value Everyone. The goal of this camp is to teach children the value of helping others and changing the community in a positive way. Partnering with The Sustany® Foundation, G.I.V.E Camp has visited Davis Island Sea Plane Basin for a clean up project, created recycled art projects and toured an organic farm. Children are also taught that one person can make a difference when it comes to sustainability and community service. As an example local author Stephanie Armenia was on site to introduce her ‘One Bottle One Dream’ Recycling Project. Armenia says her goal is to ensure each child understands that their environmental choices matter and have a direct impact on our earth. While reading her book, When Will We Be Recycled, Momma?, campers take a recycling vow, empowering them with the appropriate knowledge and action skills they need to keep plastic water bottles out of our landfills. Each camper was gifted a book as part of the G.I.V.E Camp. The next G.I.V.E. camp for ages 9-12 is scheduled for August 8-12. For more information contact Sarah Morris, YMCA Childcare and Camp Director at sarah.morris@tampaymca.org or 813-269-9404. Thanks to Going Green Tampa Bay for this story.